Vehicle manufacturers offer turbochargers and use smaller displacement and/or fewer cylinder engines to optimize power vs. fuel economy trade-offs. For example, instead of 6-cylinder engine, a manufacturer can offer a 4-cylinder with a turbocharger. When the turbo is operating, customers get the performance and power benefits of a 6-cylinder engine and when the turbo is off, they get the fuel economy of a 4-cylinder. Since, an engine’s power is proportional to the amount of air and fuel delivered to the cylinders, the turbocharger increases the inlet manifold pressure and density so the cylinders get a greater mass of air during each intake stroke. The pressure ratio (πC) versus air flow determines the performance of the turbocharger. 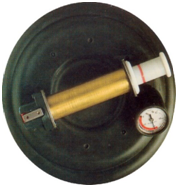 The absolute pressure sensors used in an engine control system are typically rated at 200 kPa (2 atmospheres or 29.4 psia). 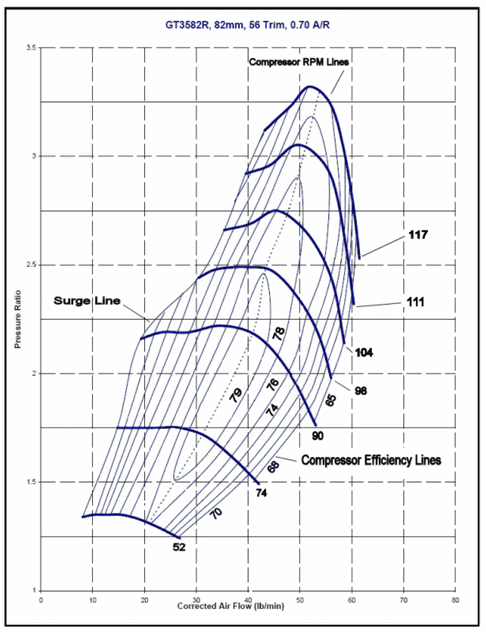 Pressure ratio vs. corrected airflow plot for a Garrett GT3582R compressor. Blink once for yes, twice for no. This technique is frequently used in movies, TV and real life to communicate with a person who is severely injured. It is also used to communicate with “spirits” and even as a secret code for perfectly healthy individuals. In either case, the communications are always limited to yes or no. With the help of pressure sensors, the ability to communicate and even control objects could improve dramatically. In the report, “Sniffing enables communication and environmental control for the severely disabled,” researchers investigated and confirmed a premise that in addition to eye control, sniffing may remain unimpaired following a severe injury. This is of interest especially for quadriplegic and “locked-in syndrome” patients. Locked-in syndrome patients have intact cognition but are completely paralyzed, so communicating using eye blinks is a harsh reality. For their analysis, researchers needed to measure nasal pressure and convert it into electrical signals; they needed a pressure sensor that could provide very accurate, high resolution linear measurements of low pressure signals. For their sniff controller, the researchers used All Sensors’ 1-INCH D1-4V-MINI Miniature Amplified Output pressure sensor. 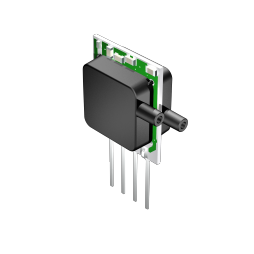 With this sensor, common mode errors and output offset errors due to change in temperature, stability to warm-up, stability to long time period, and position sensitivity are significantly reduced. To confirm their theory and the possible capabilities of nasal pressure variations, measurements on healthy subjects were made using a mouse, joystick and the sniff controller. Figure 1 shows the approach, data and sensor used for the measurements. With the theory confirmed on healthy individuals, the next step was testing on the target test group. Figure 1. Data from sniff controller measurements (a) using the 1-INCH D1-4V-MINI low pressure sensor (b) show excellent results compared to well-established mouse and joystick control techniques. Using precise nasal pressure measurements, the researchers’ test results show that sniffing allowed completely paralyzed locked-in participants to write text and quadriplegic participants to write text and even maneuver an electric wheelchair. 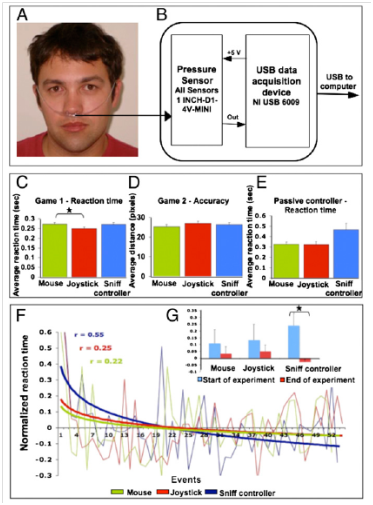 They also determined that the sniff controller can be used independently of respiration, so even artificially-respirated individuals can benefit from its implementation in end products. In addition to its use in those end products, the 1-INCH D1-4V-MINI can provide the required accuracy for many other respiratory measurements and other low pressure measurements in medical and other applications. Designers often look to nature for ideas that can be implemented in new products. Octopus suction cups provide an interesting pressure example. When the octopus’ sucker is sealed to a surface, contraction of its radial muscles thins the wall of the sucker which tends to increase the enclosed volume. However, the cohesiveness of water resists volume expansion and the pressure of the enclosed water decreases instead. With this mechanism, an octopus can create a pressure differential of 100-200 kPa (14.5-29 psi) at sea level and generate a significant amount of force. Suction cups allow professional glazers to easily pick up and move large pieces of glass. One company offers a Vacuum Cup Octopus with Pump that can lift a maximum weight of 185 kg (407.9 lbs.) vertically with a 300-mm (11.8-in) diameter vacuum cup. One version includes a manual vacuum pump with a leak gauge to monitor the effectiveness of the suction. Vacuum suction cups offer a versatile method of material handling. In fact, suction cups also allow robots to pick different smooth surfaced objects. The approach has been applied to the robotics field since the 1960s. One recent research effort focuses on suction cups that can be used on robots designed to perform tasks in unstructured and contaminated environments. Of course, monitoring the amount of vacuum (negative pressure) with an accurate and rugged microelectromechanical systems (MEMS) pressure sensor can provide an even greater amount of control to more sophisticated suction applications.